Sure, the health benefits of not sitting all day are substantial, even if the positives of standing all day are inconclusive. The trick, it seems, is to change position often, or maybe even to walk while you work. 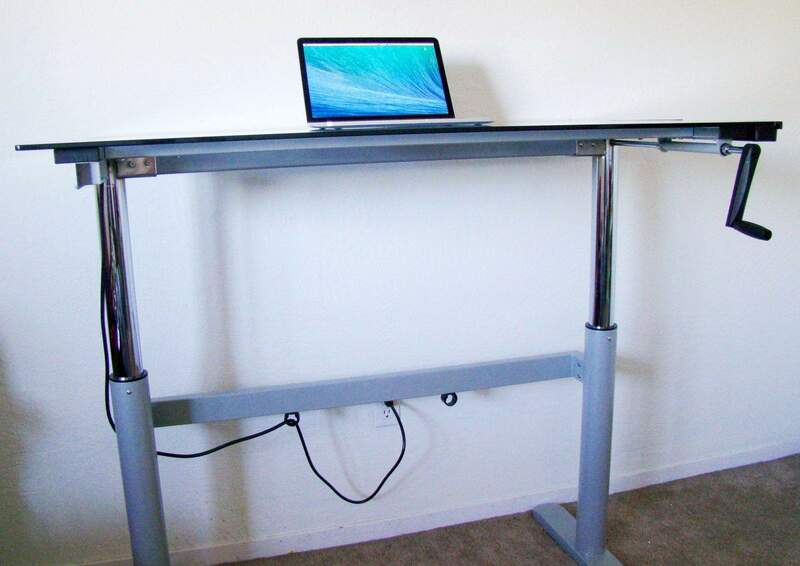 The Rebel Crank-Up 1000 standing desk is a boon to those who want to be able to work in an erect posture but still sit down when they need to; sitting improves fine motor control and lessens leaning, for example. As I stood at the review unit Rebel Desk sent my way, I couldn’t help but feel cooler, hipper, and more upright than I had in various office jobs over the years. Whether I’ll lose any weight from standing all day or not is debatable — one study showed an extra 50 calories burned per hour of standing — but at least I’ll have less time in the saddle than I used to. That can’t be a bad thing, can it? The Rebel Desk makes all of this standing and sitting again super easy with a thick tempered glass top (it comes in a Teak model, too) and some seriously sturdy desk legs. This is one solid piece of office furniture. First up, the desk is uber modern. The glass top may require a mouse pad if you’re using a pointing device that’s not a trackpad, but it’s really a shiny chrome experience with a full 48 by 28 inches of flat space for all your gadgetry. The crank is made of a sturdy black plastic, and the turning portion of the handle can fold down so you don’t walk into it as you pass on by the desk. No one wants a crank in their gut. Cranking the desk up and down is smooth and easy, though it starts to chug at the upper limits of the desk height (about 48 inches), which is where my 6-foot-two frame needs it. 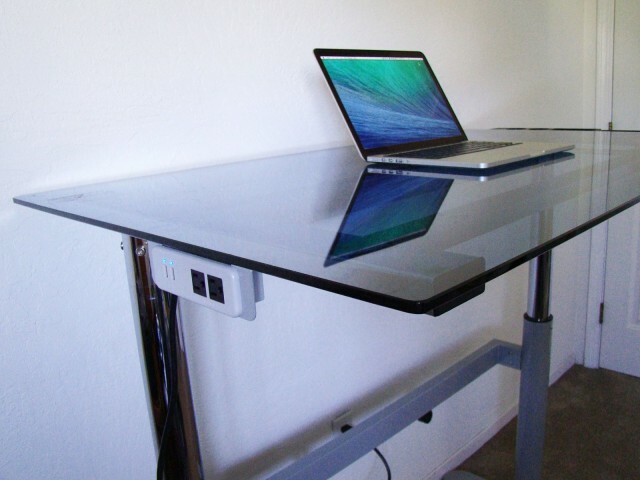 Ergonomically, you’ll want to place the desk at a level where your elbows are at right angles and your wrists aren’t bent up or down in an awkward angle. There’s some plastic organizer boxes that clip easily onto the right side of the desk, and an incredibly handy power strip affixed to the left with two grounded plugs and two powered USB ports to charge those thirsty devices you have on your desk, too. This lets you plug stuff in without having to bend down to the wall plug or a power strip on the floor, though a few more plugs and USB ports would be welcome. In daily use, I was able to load the desk up with a big HDTV, my MacBook Pro, and a host of speakers, camera gear, and gaming mice, and the occasional MIDI keyboard. Cranking the desk up and down was just as easy fully loaded as minimalist, and made setting the big heavy stuff up on top of the desktop a breeze. My legs took a few days to get used to standing up, so I certainly appreciated being able to drop the desk down to “normal” height to pull up a chair or yoga ball to sit on for an hour or two at a time. Rebel Desk makes a treadmill that fits right underneath this crank-up desk, though this matching accessory is $50 more than the desk itself. Ultimately, if your aim is to use a standing desk that you can lower to a regular seated desk position when you want to, the Rebel Crank-Up 1000 is a pretty fantastic piece of furniture. At $599, it’s an investment for sure, but you will get free assembly and packaging removal when you order one. That’s worth at least a hundred bucks or so right there. The good: Sturdy and strong, this desk will have you standing or sitting at your convenience. 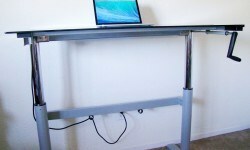 The cranking motion is smooth and easy, and the desk can get as high as 48 inches. The bad: Glass top is no good for optical mice; could use more power plugs and USB ports. The verdict: If you want a real piece of adjustable furniture that looks great at any height, this is a fantastic option.